Advantage Air is an Australian based HVAC manufacturer based in Perth, Western Australia that sells HVAC systems in Australia and South Africa. 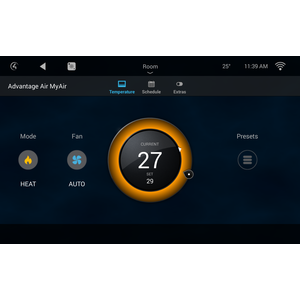 MyAir is Advantage Air’s premium reverse cycle air conditioning system with 10 zones and individual room airflow control. 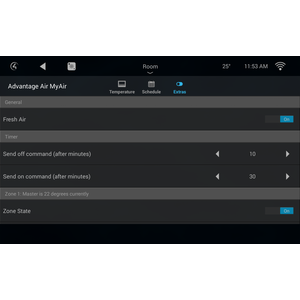 Chowmain’s MyAir driver for Control4 will work with all models of MyAir by providing two way control and feedback. Timer functionality (Turn on/off AC after x minutes – upto 12 hours). Advantage Air is a major HVAC manufacturer in Australia whoses products are heavily utilised in both Western Australi, Queensland and South Africa. Integration of their MyAir product allows for a wider range of HVAC solutions for Australian Control4 consumers and dealers. 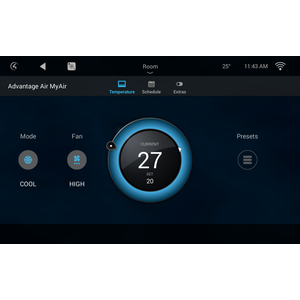 MyAir controls Samsung, Daikin, Fujitsu, LG, Panasonic, Toshiba, Hitachi, Mitsubishi Electric, Mitsubishi Heavy Industries, Carrier and Midea air-conditioners. 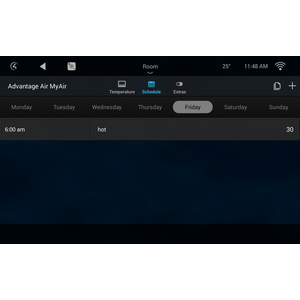 MyAir’s touchscreen controls both the air-conditioning unit and air management system, so there’s no need for 2 control panels. Talk to your Advantage Air representative today about 3rd party integration solutions. Where can i purchase Advantage Air? My Advantage Air system has multiple AC's connected to it. Does your driver support multi AC's? 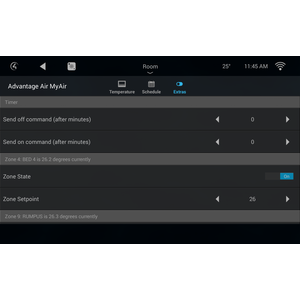 Yes our driver will support upto 4 AC's which are connected to the MyAir system. This is the current maximum. Can i control individual zones with this driver? 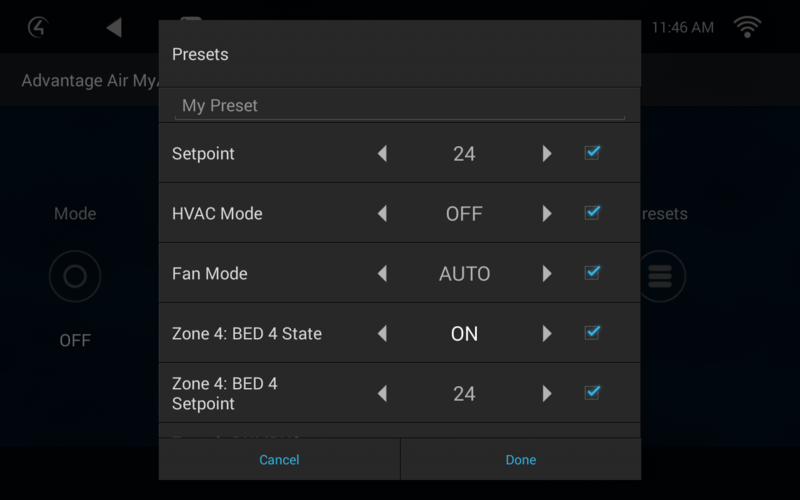 Yes our driver automatically imports in all zones associated with the each AC and will allow you to either control the setpoint or control the airflow percentage. One zone should be set as MyZone so that the HVAC system has a reference point. Yes our driver has built in presets and scheduling. 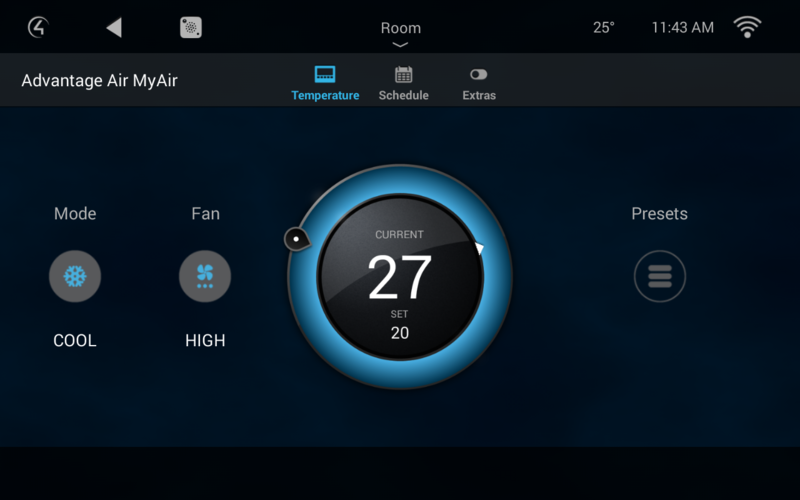 The driver can also utilise the built in timer to turn on and off MyAir. This driver requires functionality that is only available in OS 2.9. As such this driver will not work in earlier versions of Control4 OS.